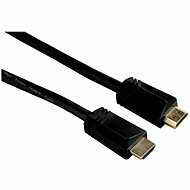 A professional HDMI connection cable suitable for Ultra HD. The cable supports 3D display, reverse audio channel, CEC control signals, ACE recognition, and Ethernet data transmission at a speed of up to 100Mb/s. 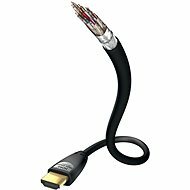 The cable also supports the transfer of high-definition, uncompressed audio-visual content with up to 4096x2160 pixels and innovative audio formats. The connectors on both sides can rotate in 2 axes, allowing you to save space and better hide the cable behind the device. The gold-plated connectors ensure a reliable connection with small transient resistors. The individual wires are fully shielded, resulting in the elimination of interfering phenomena during transmission. For shipping to other EU countries visit this page Hama connection, rotary connectors HDMI - HDMI 1.5m. Für Versand nach Deutschland, besuchen Sie bitte Hama Verbindungskabel mit rotierenden Steckern, HDMI-HMDI 1,5m. Chcete doručit zboží do Česka? 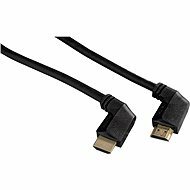 Prohlédněte si Hama propojovací otočné vidlice HDMI - HDMI 1.5m. Chcete doručiť tovar na Slovensko? Prezrite si Hama prepojovací otočné vidlice HDMI - HDMI 1.5 m. Für Versand nach Österreich, besuchen Sie bitte Hama Verbindungskabel mit rotierenden Steckern, HDMI-HMDI 1,5m. Magyarországra történő kiszállításért tekintse meg ezt a termékoldalt: Hama összekötő forgókészülék HDMI - HDMI 1.5 m.